buzzing with bees after a terribly harsh winter, was also very good news. coming from the hives are all good signs that the bees at Bello Uccello apiary have survived well. pollen- rich- and- honey- laden supplies(about 100 lbs of honey per hive) has served the bees well. in their hives and recommended feeding the bees with GMO Soya based Pollen Substitute. scientific in its approach to gardening and beekeeping and can be relied upon to guide us as keepers of bees. Our bees had plenty of pollen in their hives as they went into the winter and we froze frames of pollen and honey so that in the Spring we can feed them with their own natural food. The honey which we take from the hives is “surplus” and we do not give “sugar water” and corn syrup to the bees and take their honey nor do we feed them pollen substitutes. our bello.bees@gmail.com to pre register or if you have any questions about the course. for they are now out and about! IT IS TIME FOR US AT BELLO UCCELLO TO COME OUT OF HIBERNATION ,FOR SPRING HAS ARRIVED EARLY THIS YEAR, AND ONE OF OUR HIVES HAS BEEN FLYING AROUND FOR AT LEAST THE LAST TWO MONTHS! AMAZING! A VERY SERIOUS DECISION HAD TO BE MADE BY US THIS WINTER ,DUE TO THE FACT THAT THE BLUEBERRY PRODUCER NEAR US EXPANDED HIS OPERATION AND NOTIFIED US OF HIS INTENTIONS TO USE CHEMICALS ON HIS BLUEBERRY PLANTS THIS YEAR. THE BLUEBERRY INDUSTRY IS EXPANDING THROUGHOUT OUR PROVINCE AND WITH THE LARGE SCALE MONO-CROP OPERATIONS COMES THE DISEASES AND PESTS PROBLEMS WHICH CONVENTIONAL FARMING USUALLY DEALS WITH BY APPLYING TOXINS/CHEMICALS TO THEIR CROP. ALTHOUGH WE SPRAY OUR APIARY WITH A PROTECTIVE LIFE ENHANCING, NATURAL PREPARATION, WE DID NOT FEEL WE COULD TAKE THE RISK OF HAVING THE HONEYBEES EXPOSED TO THE IMMUNE- SYSTEM STRESSORS OF CHEMICALS AND/OR POSSIBLE TOXINS. 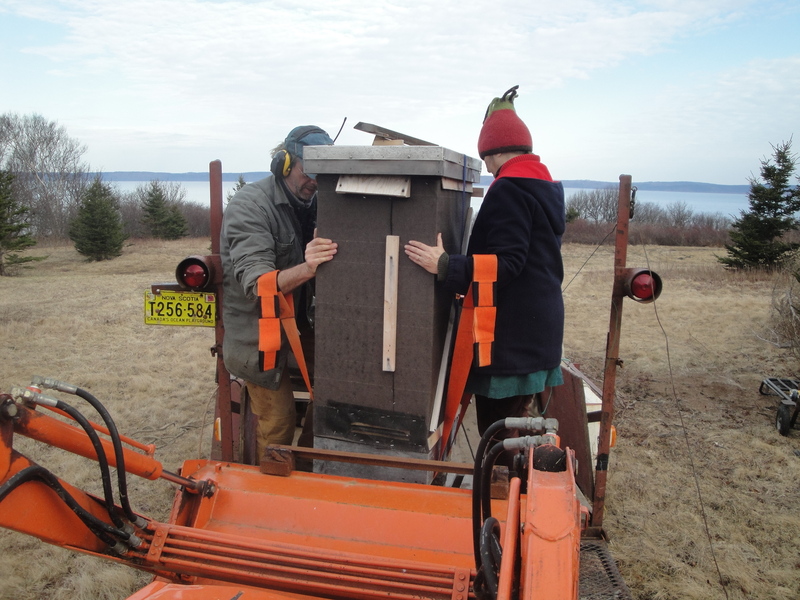 SO ONE EARLY MARCH MORNING WE HAD A FRIEND ARRIVE WITH HIS TRAILER AT THE APIARY AND USING CARRYING STRAPS, KLAUS AND I LIFTED THE HIVES (very heavy hives!) ONTO THE TRAILER AND ABANDONED THE BEAUTIFUL APIARY. 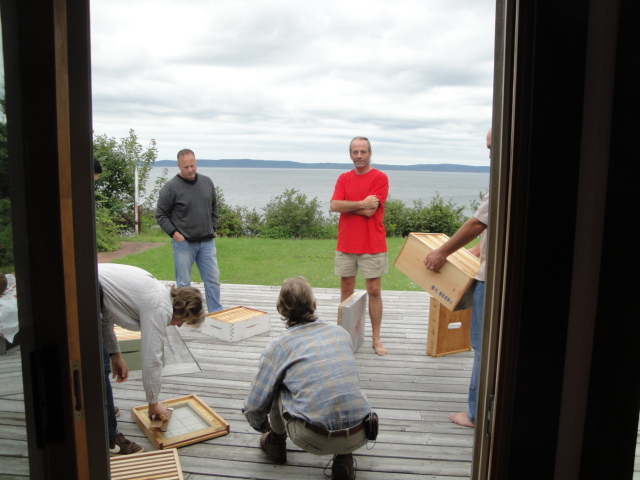 IT IS VERY FORTUNATE FOR US THAT WE OWNED A FACILITY AND LAND FURTHER ALONG ST MARYS BAY, WHERE WE HAD ONE HIVE ALREADY ESTABLISHED SINCE JUNE 17TH LAST YEAR. BY MID AFTERNOON THE NEW APIARY WAS ESTABLISHED AND THE BEES HIVES, STILL COVERED AND SEALED, SAT IN THEIR NEW HOME, WAITING FOR THE SUN. WE ARE HAPPY TO REPORT THAT THIS CHANGE IN LOCATION HAS AFFORDED US THE “EXCUSE” NEEDED TO VISIT OUR COMFORTABLE COTTAGE WITH NO PHONES OR ANY “LIST OF THINGS TO DO” AND JUST ENJOY A COUPLE OF HOURS OF VISITING THE BEES AND ENJOYING THE QUIET. IN A CONTEMPLATIVE MOMENT WE WONDERED WHAT WOULD HAVE HAPPENED IF WE DID NOT HAVE THE LUXURY OF ANOTHER PROPERTY WHERE WE COULD ESTABLISH A SYMBIOTIC LIFESTYLE WITH THE HONEYBEES . WHAT OTHER THREATS ARE BEING FACED BY ORGANIC/BIODYNAMIC BEEKEEPERS? IT SEEMS THE PLANET IS GETTING VERY VERY SMALL FOR PROVIDING THE SPACE NEEDED FOR THE HONEYBEE TO LIVE. TODAY THE HIVES ARE HUMMING WITH ACTIVITY AND GRAY, GREEN AND BRIGHT YELLOW POLLEN IS BEING DELIVERED BY THE VERY BUSY WORKER BEES. BY THE WEIGHT OF THE HIVES THEY STILL HAVE LOTS OF HONEY AND POLLEN STORES INSIDE, BUT ONE THING WE HAVE LEARNED ABOUT THE HONEYBEE – THEY LOVE TO STORE THE FOOD BEST OF ALL. THE STRAW THAT WE PLACED INSIDE THE COVERS FOR THE WINTER DID A GREAT JOB, AS THERE APPEARS TO BE NO CONDENSATION ON THE INSIDE COVER OF THE HIVE. THE BLUE STYROFOAM INSULATION ON THE OUTSIDE OF THE HIVE ON THE NORTH AND NORTHEAST SIDE WAS REALLY EFFECTIVE ALSO. 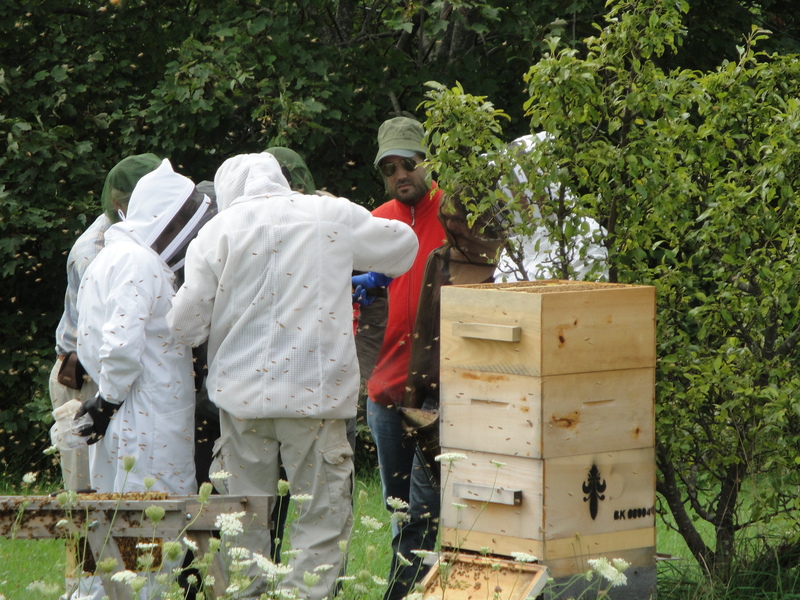 WORKSHOP FOR BEGINNERS BASED ON BIODYNAMIC BEEKEEPING PRACTICES AT OUR APIARY, ON SATURDAY, MAY 26TH AND SUNDAY, MAY 27TH. IN THE TWO FULL DAYS YOU CAN LEARN ABOUT THE LIFE OF THE HONEYBEE, INSPECT A HIVE, LEARN TO ASSEMBLE A HIVE, DISCOVER PRACTICES WHICH ENHANCE THE HEALTH OF YOUR HIVE WITHOUT THE USE OF CHEMICALS,VISIT THE HONEY HOUSE AND EXTRACT HONEY AND ACQUIRE SKILLS AND KNOWLEDGE WHICH WILL BE HELPFUL TO YOU, AS YOU BECOME A KEEPER OF BEES. AS WE DID LAST YEAR, THERE WILL BE LOTS OF ORGANIC COFFEE AND TEA WITH HOMEMADE MUFFINS AND LUNCHES AND SNACKS PROVIDED EACH DAY AS PART OF THE WORKSHOP FEE. 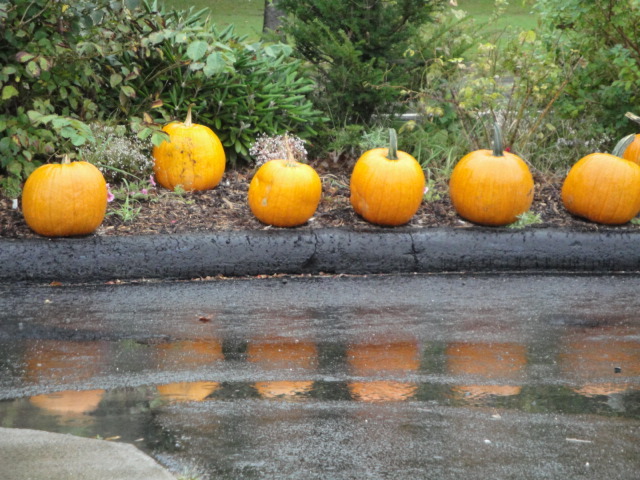 What an extraordinary autumn we are having here in Southwest Nova – really warm weather and an extended season for the foraging honeybees. If bees wore clothing they would be dressed in shorts and tank tops with these temperatures. But despite what our eyes see, the phenology of bees- to- flora is telling another story. It is saying that the flower sources for the nectar and pollen are getting low and the beehive is in preparations for winter. The obvious signs of this winter preparation is the “eviction of the surplus Drones” from the hives. The Drones are the male bees in the hive, all the other bees are female. They bring balance to the hive and naturally it is with the Drones from the hives that the virgin Queen Bees mate – but that is a unique occurrence . The cycle of the Drone is such that Rudolf Steiner says they bring an earthly connectivity to the hive ,which otherwise has a strong Sun connectivity. But just like Bertie Wooster’s “Drone’s Club” in the famous BBC Series, Jeeves and Wooster, there is a good bit of lazying around done by the drones in the hive, and winter survival means non-working surplus would threaten the survival of the hive, so they are thinned out by the worker bees. 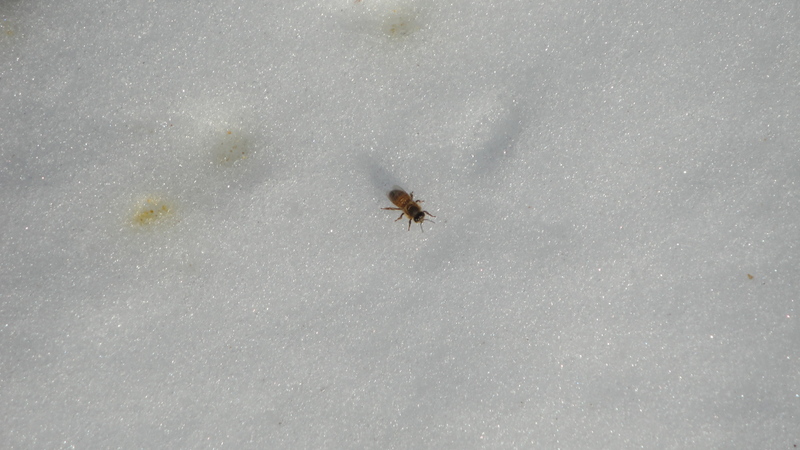 Another sign that winter is well underway and it is no longer “business as usual” for the bees, is the “robbing” . Robbing takes place when the nectar sources are low and the bees wish to continue to collect as much food as possible. They look upon the other hives in the apiary as a convenient place to pick up some honey and thus the robbing. We shut down the size of the hive entrances to allow the guard bees in the hives to better manage the smaller “gate way” and they do a great job. However if you have a weak hive, it could be the robbers will win and overtake the guards. One interesting thing about this situation is that possibly the bees in the robbed hive might then just go and join the robbers hive, and if not, they will parish from starvation. Bello Uccello Estate Honey now is available to buy in Halifax through: bluecrowinspirations@gmail.com Phone: 902- 404-8677 to arrange pick-up. If you wish to purchase chemical free, natural, seaside wildflower honey that has not been pasteurized, has only been lightly gravity filtered so that traces of pollen and propolis are still in the honey and that comes from bees raised by biodynamic principles and Love and you live in Halifax, you now have the opportunity to do so. 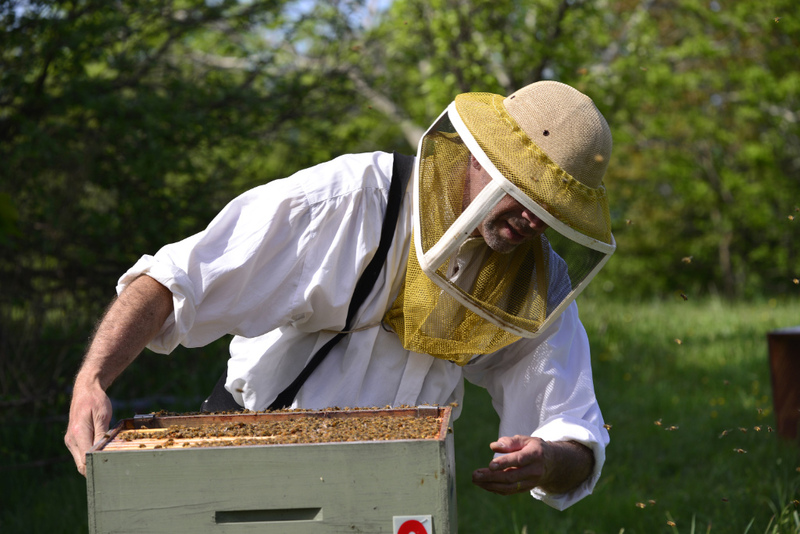 Bello Uccello Estate Apiary will be selling its honey at the Annapolis Royal Farmers Market this coming Saturday morning . Hope to see you there. A new Rudolf Steiner inspired Waldorf Kindergarten opens its doors this coming Wednesday, Oct 4th at the Oakdene School in Bear River. We will be visiting these children with our observation hive and quite looking forward to introducing the children to the bees. In the New Year we will be posting the workshops for 2012 and they will include a Natural Beekeepers Course for Beginning Beekeeping, a Natural Beekeepers Course for Experienced Beekeepers and a General Natural Beekeeping Workshop for those who wish to learn more about the honeybees and how they can help. For more information on our workshops write to: bello.bees@gmail.com Our new website is under construction http://www.beecosmic.com and should be up and running in the new year. In the Apiary we are mowing the grasses short, cleaning the area of debris, and making sure there is nothing rotting to cause bad bacteria. The Aqua media (an amazing local product which is 100% natural and is made from transformed scallop shells is placed on the bottom boards to give great air filtration and eliminate any molds. Part of the Langpohl Beehive System incorporates these scallop shells in the ventilation system. The towers are now lowered to two supers per hive and most importantly, the bees seem happy. Happy Thanksgiving to all.